Other Requirements and Warnings: From the pictures of the studio trams you see everywhere, you might think the tour is calm and smooth. However, on parts of the tour, the tram will be enclosed in dark places. You’ll be watching special effects that may include strobe lights and theatrical fog, and the tram can jolt or stop suddenly. Check the restrictions posted near the tour entrance if you have any concerns. All the restrictions and cautions are listed in the pages at the end of this guide. This ride requires wearing 3-D glasses, but only for King Kong 360. If they give you a headache, you’re not alone. The first thing to do is check when you get them to see if they’re scratched or have other obvious problems. Hand them back and ask for new ones if needed. Wear the 3-D glasses over your regular ones if you can. What to Do with Your Stuff: You can take it all on with you. If you’re sitting on the outside seats, hang onto all of it and be sure nothing slips out below the sides. Boarding: You’ll wait in a line in numbered rows until your tram arrives. To board, you’ll step up into the tram, and if you’re the first one on, you’ll walk across to the far side. Where to Sit: Avoid the back row of any tram car, unless it’s cold weather. That’s where the engine is, and it’s both hot and noisy. If you want to get a really good look at the Jaws shark, Whoville or the Bates Motel, stand in the front of the boarding line and go to the far side of the tram. For better views of the picture cars, flood and War of the Worlds, get in line to board last in your row. Children must sit in the middle of the row. King Kong 360 3-D, an encounter with the giant ape that surrounds the tram with 3-D images. A simulated earthquake and flood in a subway station set. Fast & Furious, is a 3-D experience based on the film franchise. Special effects make it feel like you’re being pulled along at breakneck speed on the LA freeways. You’ll also take a drive through some of the backstage filming areas (when they’re not being used), go past the Bates Motel and Psycho House, pass Whoville, see that creepy Jaws shark and go through the airplane crash scene from War of the Worlds. The exact route varies depending on where people are filming. Everyone likes the studio tour. It includes some fun sights and great special effects. It’s almost worth it just for the King Kong part. However, if you think you’re really going to see people making movies and television shows on this tour, you’ll be disappointed. 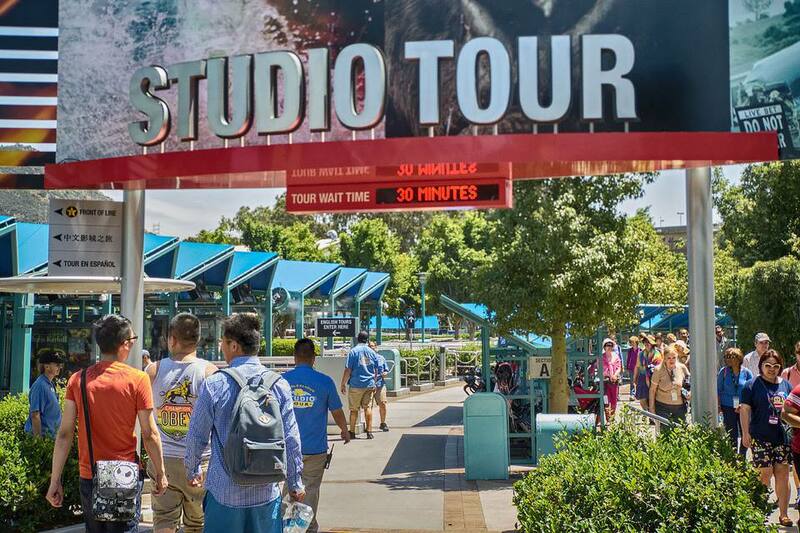 Think of it as more of an enhanced ride than an in-depth tour of a working studio. Studios seldom work on weekends, You'll see more hustle and bustle during a weekday tour, but on weekends, you may get to drive through sets that are in use during the week. The tour stops running before the park closes. Take it early to be sure you don’t miss it. If you’re sitting on the sides, keep your camera strap around your neck. If you hold it on your lap and let go for just a second at the wrong time, it will end up dancing on the pavement. Some parts of the tour can scare small children, especially the Jaws shark. You’ll see some shooting schedules posted near the entrance. Don’t let them fool you. They let you know what's being filmed at Universal that day but may give the mistaken impression that you'll be able to watch all of those filming sessions. If the experience makes you want to learn more about how films are made, follow up with one of these working studio tours. It took the Wizarding World of Harry Potter a while to make its way to Universal Studios Hollywood, but folks in California can enjoy some of the same attractions as visitors to Universal's Florida parks do. In California, Wizarding World covers about 6 acres, making it about half the size of the one in Florida. But before you start feeling all upset about that, you need to know that the Dragon Challenge roller coaster takes up two-thirds of Florida's Wizarding World. That makes the rest of the California World only slightly smaller. The main attraction is the ride Harry Potter and the Forbidden Journey. It's a motion-based simulator ride through a replica of the interior of Hogwarts castle. The hyper-realistic journey makes its U.S. debut in Hollywood. Guests wear Quidditch-inspired 3D goggles as they follow Potter's journeys, spiraling and pivoting 360-degrees along an elevated ride track. This ride has a 48" (122 cm) height requirement and employs restraints that may not accommodate guests due to their body shape or size. There's a test seat outside where you can find out if you can fit or not. The other ride is the family-friendly Flight of the Hippogriff. It's slightly taller, longer and faster than its Florida counterpart. You have to be at least 39" (99 cm) tall to ride with a companion and taller than 48" (122 cm) to ride alone. You can dine at the Three Broomsticks restaurant, which recreated the inn and pub from the movies. And get a butterbeer to drink. Shops include Ollivanders wand shop, Zonko's joke shop, Honeydukes candy store, Dervish and Banges clothing store, Filch’s Emporium of Confiscated Goods gift shop, Wiseacre’s Wizarding Equipment, Gladrags Wizardwear, and Owl Post stationery shop. The magic wands are fun, and new spells are added regularly. It’s best when you can walk up and do your hocus-pocus right away, but less so if you have to watch a half dozen people to do it ahead of you (and wait while they photograph themselves doing it). Don’t miss the little things, especially in Wizarding World. Listen for Moaning Myrtle in the Hogsmeade restroom, and stop to get a compliment from Madam Malkin’s Talking Mirror in the corridor between Dervish and Banges and Gladrags Wizardwear. To make room for all of that, Universal demolished the Gibson Amphitheater and Adventures of Curious George water play area. Based on AMC’s television series “The Walking Dead,” this attraction is a walk-through maze, similar to the ones Universal puts up at Halloween, but open year round. It features scenes from all seasons of the popular show. Visitors don't just watch the action but are immersed in it, cast as survivors of a zombie apocalypse and trying to survive. Compared to the Halloween version, the effects are much more realistic, including "utterly realistic flailing arms," says USA Today theme park writer Arthur Levine. Not everything you encounter is electronic, though. It also uses actors who have to go through a Walker Boot Camp to learn how to walk, move and stay in character. And they recruited executive producer and director, Greg Nicotero to be sure those walkers look just right. This is not an attraction for the squeamish. It's rated PG-13, but may be too much for folks 3 times that age. It's included with general admission. Other Requirements and Warnings: If you are susceptible to motion sickness, use your favorite remedies before riding. This ride requires wearing 3-D glasses. If they give you a headache, you’re not alone. The first thing to do is check when you get them to see if they’re scratched or have other obvious problems. Hand them back and ask for new ones if needed. Wear the 3-D glasses over your regular ones if you can. The area around the ride is a recreation of the Simpsons' hometown of Springfield. You'll find places to eat there with familiar names, and it's a fun area for taking photographs. If the Kids Can’t (or Don’t Want to) Ride: The Simpsons is one of the several rides with a Child Switch option. Both adults and the kids can all get in line and swap off waiting with the kids. What to Do with Your Stuff: You can leave your loose belongings on the floor beside the wall while you ride. Boarding: Ride vehicles have two rows of 4 seats. The ride vehicles are located in individual rooms, and you can just step in and out. Where to Sit: It’s hard to see what’s going on from the back row, especially if someone tall is in front of you. The difference is significant, and it’s worth asking if you can skip your turn and sit in the front row of the next group. Some people also suggest asking for the middle floor, car 2 or 3. Those spots give the most balanced view of the Omnimax screen. And if you’re tall, try to get in the front row because of the ceiling in the back slopes sharply down. Krusty the Clown has a new ride at his amusement park, Krustyland. It’s called "Thrilltacular: Upsy-Downsy Spins-Aroundsy Teen-Operated Thrill Ride.” You - and the Simpson family - are going to be its first riders. Unfortunately, Sideshow Bob has escaped from prison and is out for revenge. He wants to kill Krusty and the whole Simpson family for their role in putting him in prison. Leaving Grampa and little Maggie behind because of safety considerations, the riders take off. Soon, Sideshow Bob takes over the controls, changing the setting from “thrilling” to “killing.” Mayhem ensues, with the riders flying off the tracks (and back on), dodging lots of hazards. Meanwhile, little Maggie has been exposed to radiation and grows to enormous size. Bob then steals her pacifier and tells her that she must destroy Springfield to get it back. You can probably guess that all ends well enough, as Bob is conquered and the ride vehicle descends gently to the ground. The storyline pokes fun at every other big theme park in the area, and takes a few jabs at Universal itself, too. It’s all very funny. And a lot of regular characters from the series make an appearance, all voiced by their original actors. The Simpsons Ride isn’t a roller coaster, but it does involve a roller coaster ride - a simulated one. Given how much goes wrong, you’ll be glad you’re not on the real thing. The action takes place inside and 80-foot diameter dome, with motion simulation and 3-D film effects that make you feel like you are zooming around through a cartoon-style amusement park. You’ll feel like you’re climbing, dropping and turning fast. The vehicle itself tilts, spins and jolts. Some people say The Simpsons is the most entertaining attraction in the park and it’s especially popular with fans of the Simpsons show. Yelp reviewers rate it 4 out of 5. Lines can also be long, and there’s no single rider option. Other Requirements and Warnings: If you are susceptible to motion sickness, use your favorite remedies before riding. Don’t ride if you are sensitive to strobe lights or theatrical fog. What to Do with Your Stuff: You can stow your bags behind your feet in the ride vehicle. Where to Sit: Cars seat 2 rows of 4 people each. Seats closest to the screen aren’t quite as good as they are in the middle section, front-to-back-wise. Inventor Gru and the Minions are looking for new recruits and Gru’s personal scientist Dr. Nefario has a solution: A laser gadget that converts humans into minions. But Gru is busy, planning a surprise for the anniversary of adopting Margot, Edith, and Agnes. In fact, he’s so busy that he turns the newly-created minions’ training over to the girls. Riding in a hovercraft, they test your "strength, speed and ability to not die,” but something goes wrong. You’re trapped in a restricted area and falling into a gravity well. The girls keep losing and retrieving their anniversary present for Gru. The finale features a fireworks display celebrating the anniversary of the girls' adoption. Unfortunately, a stray rocket hits the minion-making laser, the "minionization" process reverses, and Gru exclaims: "Aw man, they're human again. Bring in the next group." Minion Mayhem is a live motion simulator ride with 3-D filming, similar to The Simpsons Ride or Star Tours at Disneyland. The simulation makes you feel like the ride vehicle starts and stops quickly drops and climbs. It also tilts and includes some sudden jolts, but none were too jarring for us. Melbourne Herald Sun says "Technology, movie know-how and humor are seamlessly combined” and we agree. In fact, it’s one of the two most immersive rides in the park, the other being Transformers. Yelp reviewers (so far) give it mostly 4’s and 5’s. You’ll have more fun if you know a little about the movie. If you’ve got a child with you, they can explain. Otherwise, read the story above and pay extra attention to the videos in the queue. Even if you know the story, don’t zone out in the queue or you’ll miss some pretty cute jokes. Upper Lot, Lower Lot: What's That All About? In the context of Universal Studios Hollywood, Upper and Lower mean exactly what you'd expect: one area is higher than the other because the park is built on a hill. And that's a pretty steep hill, too. This photo shows only one part of the long series of escalators that carry people up and down. The shows and attractions you've seen before this page are all on the Upper Lot. The ones that follow are on the Lower Lot. It takes 6.5 minutes each way to travel between the two parts of the park. An easy strategy is to visit the Lower Lot first, then go up and do everything else. Other Requirements and Warnings: If you are susceptible to motion sickness, this ride is one of the worst. Use your favorite remedies before riding. If the Kids Can’t (or Don’t Want to) Ride: Transformers is one of the several rides with a Child Switch option. Both adults and the kids can all get in line and swap off waiting with the kids. What to Do with Your Stuff: If you need to stow anything, lockers are located next to Revenge of the Mummy, on the escalator side. You can use one for free for 90 minutes. Each one is big enough to hold a medium-sized backpack or a big shoulder bag, along with a few smaller things. Go to any video station - each one controls the lockers that are around it. You’ll do a fingerprint scan, and the scanner assigns a locker. Just open it, put your stuff in and remember your number, just in case you need it later. Boarding: You walk right into the ride vehicle and sit down, with no steps up or down. Where to Sit: Each car seats 3 rows of 4 people. The front row is slightly better, but any seat is a good one. The storyline of Transformers can be hard to follow, especially if you haven’t seen the movies, but don’t worry - you don’t need to know all the details to have a good time. The first thing to know is the two main characters, Megatron and Optimus Prime. They’re the ones painted on the outside of the building. Optimus Prime (the good guy) is blue and red. Megatron (bad guy) is mostly grey metallic. The story begins in a time of extreme danger, and you need to help the good guys win the war. As the story progresses through a series of actions, the ride vehicle moves to 3-D high definition video screens. You’ll fight, get blasted with rockets, nearly sucked out of a building and dragged through the side of a skyscraper. Of course, like any good theme park ride, it ends when the good guys win and Optimus Prime thanks you for helping to save humanity. Transformers is a maximum immersion simulator ride that surrounds you in 3-D images. It’s called a track-based roaming flight simulator, and it can make you feel like you’re going 60 mph while battling 60-foot-tall Transformers. The illusion of reality is breathtaking. The ride vehicles suddenly and dramatically accelerate, stop, spin, climb and drop. They also tilt, and the sudden movements can be jarring. Yelp reviewers rate it 4.5 out of 5, saying things like "Best ride/experience I've been on period!” "DO NOT miss” and "Effects are insane.” However, some think the wait is too long, and one reviewer said: "The most memorable thing about this ride was the line." If you’re by yourself - or if you can bear to be parted from your companions for just a few minutes, the single rider line can save you a lot of time. It’s just as simple as it sounds: You agree to sit by yourself wherever there’s an open seat. Some people say the line for Transformers gets shorter later in the day. Getting there as soon as the park opens may also be a good strategy, as others dawdle in the upper lot or run for the studio tour. Other Requirements and Warnings: If you are susceptible to motion sickness, use your favorite remedies before riding. And if you’re afraid of the dark, this ride is dark. Really dark. If the Kids Can’t (or Don’t Want to) Ride: The Mummy is one of the several rides with a Child Switch option. Both adults and the kids can all get in line and swap off waiting with the kids. What to Do with Your Stuff: You need to stow all your stuff (bags, hats, glasses and so on) in the lockers provided outside the ride. You can use one for free for 90 minutes. Each one is big enough to hold a medium-sized backpack or a big shoulder bag, along with a few smaller things. Where to Sit: Each vehicle has 4 rows, with 4 people per row. Seating location doesn’t matter much on this ride in terms of view. Larger guests can request Row 4 where the seats are a little bigger. The story for this ride is a little thin, but that doesn’t lessen your enjoyment. It starts with a mummy coming to life. The voice of Warden Gad Hassan, the prison archaeologist from the film warns: "Run for your lives! The curse is real! Imhotep lives!” as beetles engulf him. After a short trip through the treasure room - which begins to crumble around you - you’re off like a bullet. All you’ll see for the next minute are glimpses of mummies and warriors. As the car brakes before hitting a wall, a creepy bunch of bugs covers the wall and special effects bring them all over the vehicle, too. You’ll be glad when you’re suddenly in reverse and on your way out again. This dark indoor, roller coaster ride is short, but that may be a virtue - if it were longer, it could be over-stimulating. Besides the Mummy theming, it goes forward, stops in front of a creepy bunch of bugs and then gets you back in reverse. The ride catapults the ride vehicles at speeds up to 45 mph into nearly complete darkness. It’s a little like Disneyland’s Space Mountain, only darker and scarier. Yelp reviewers rate Revenge of the Mummy 4 out of 5. Don’t leave anything in an open pocket and don’t leave your hat or sunglasses on top of your head - they’re likely to end up lost. If you are concerned about whether you can fit into the ride seating, you’ll find a sample seat outside that you can try. Jurassic Park has been a Universal Studios favorite since 1996. After more than 20 years it was time for an upgrade: In 2018, it shut down for a much-needed (and extensive) renovation. So far, details are scarce, the basic layout will likely be the same including the infamous drop, but with improved everything. No opening date has been announced yet, but it will probably happen in late May or early June. Meanwhile, the notes below apply to the old ride. Other Requirements and Warnings: If you are susceptible to motion sickness, use your favorite remedies before riding. This ride is not suitable for anyone wearing a cast. If the Kids Can’t (or Don’t Want to) Ride: Jurassic World is one of the several rides with a Child Switch option. Both adults and the kids can all get in line and swap off waiting with the kids. Single rider lines are sometimes available when the ride is busy. When you come back, scan your fingerprint again, and the locker opens. In theory, that is. In reality, I needed help from a staff member, who first suggested cleaning the scanner’s glass and my fingertip. When that failed, staff can open the lockers, but it will be easier if you can describe the contents and have ID inside to show them. Boarding: You have to step down to get in - and up to get out of this ride, which might be a bit difficult if you have any knee issues. Where to Sit: Each vehicle has 5 rows, with 5 seats per row. Where you sit determines how wet you’ll get. Many riders say to avoid the edge of the vehicle and the front row if you want to stay drier. You’ll be taking a trip around Isla Nublar. The first part of it is a quiet river voyage where you’ll see some of the dinosaurs from the film, in animatronic form. A Parasaurolophus throws the raft off course and into a raptor containment area where the creatures are destroying everything in sight. You might be safe after that, but of course, you aren’t. Eventually, you climb a long hill which positions you for the final drop. As a technician counts down to the building’s life support system turning off, a Tyrannosaurus attacks and lunges to grab the raft. You escape by plunging down a waterfall: Kersplash! Jurassic World is a water ride that starts in darkness and ends with an 85 feet (26 m) tall - that’s taller than an 8-story building. The ride vehicles are similar to touring-style rafts. They can accelerate suddenly and turn dramatically. Some people say you get wetter about half way through the ride on a short drop that brings a lot of water into the vehicle, but the ending splash contributes plenty more. Yelp reviewers rate Jurassic Wolrd 4 out of 5, and many think it still holds up almost 20 years after it was created. Other say it’s slow and lame, except for the finale and that the animatronics are outdated. This is one of the few attractions at Universal Studios that allow taking photos, but your camera is likely to get very wet before you’re done. It’s hard to avoid getting wet on Jurassic World - The Ride. Very wet. Use ponchos when they're provided, and go early enough in the day so you can dry out before it cools off. If you are drenched, you can dry off in Jurassic World Gift Shop. You'll find a number of entertaining shows at Universal Studios Hollywood, most of them movie-themed. All are on the Upper Lot. Some of the shows include strobe effects and theatrical fog. If you're sensitive to them, check the signs outside. Kung Fu Panda: This show is designed to engulf guests in an experience that goes far beyond those tired 3-D glasses, using new technologies to deliver a 180-degree, fully immersive adventure. The theatre's ultra-plush, fully articulated seats are not only comfy enough that they won't distract you from the action, but they also pivot and swivel in tandem with the action. Special Effects Stage: Learn how sound and visual effects are created and how monsters are made. Assistive listening is available - pick up a headset at Guest Services. The Blues Brothers®: This is a musical show featuring musician Jake Blues and his brother Elwood. Universal's Animal Actors: These clever animal performers will make those pet tricks you taught good old Fido look pretty simple. Assistive listening is available - pick up a headset at Guest Services. WaterWorld®: Jet ski tricks and fire effects are just part of this stunt show. Seats in the “soak zone” - where you're just about guaranteed to get wet - are painted green. Assistive listening is offered - pick up a headset at Guest Services. If you're in doubt, take a measurement before you go. You'll have to pass measuring devices like the one shown above. If you have an Accessible Parking Permit on your vehicle, enter through the toll plaza and someone will direct you to the parking area for Guests with Disabilities.